Move cursor over image to view labels. After a bit of a slump, I decided to get out & observe a little of our Moon. On the lunar west limb I spotted 2 craters that appeared so different from one another that I was intrigued. I knew that one was Grimaldi but was not certain about the other. I sat down to sketch at the eyepiece on a night of good seeing conditions in Hawaii. Riccioli Crater is the large (140 km) lunar impact crater at the western terminus of the sketch. It is bordered to the southeast by the larger (230 km) Grimaldi & to the northwest by Hevelius. Hedin is still in the darkness and only the edge becoming lit. Riccioli appears elongate with rough crater walls casting sharp jagged shadows into the basin. There is also visible roughness & debris within the crater. This debris & other striated formations in the region are believed to have been created by ejecta from the formation of the Orientale impact basin to the southwest not seen here. The roughness of Riccioli is in stark contrast to Grimaldi which appears smooth by comparison. Grimaldi, covered in lava makes it appear more like a mare than a crater. There appears to be a dark line or peak running from Riccioli to crater Lohrmann directly to the east. Multiple small brightly lit rimmed craters surround this area. A double crater with 2 bright rims of light can be seen at the northeast edge of Riccioli. 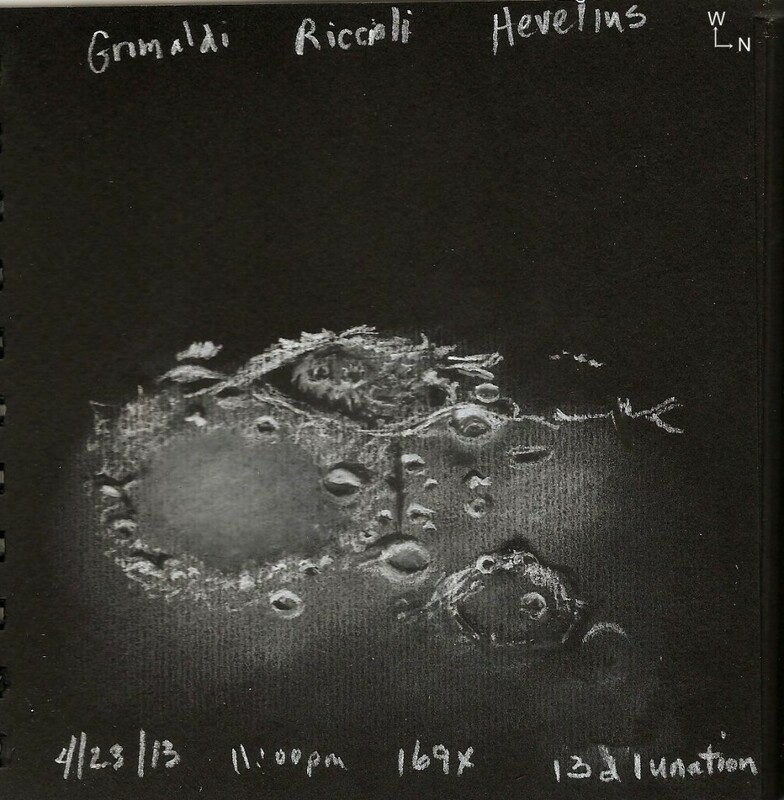 Both Riccioli & Grimaldi craters were named by 17th century Jesuit priests & colleagues Francesco Maria Grimaldi & Giovanni Baptista Riccioli, who were responsible for many of the names given to features on the Moon today. This is an excellent capture of these craters near the terminator. You have captured the scene beautifully. This is very nice, “dynamic” sketch. Thank you Marek & Dale! Well done, I like the on the spot style ! Very nice sketch. And a great way to come back from a slump! Cindy, I like how you’ve captured the shadows which gives a three dimensional effect. Thank you Thia for this wonderful Sketch!! Thank you for your comment LG!